DOMINION Electronics has announced the BL2100 Smartcat, a low-cost, high-performance single-board computer that gives OEM designers ethernet connectivity and keypad/display options all in one small package. 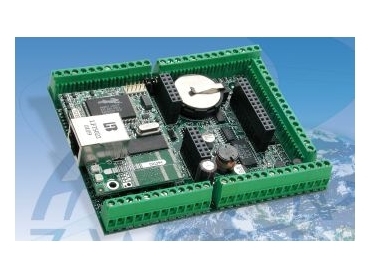 Suitable for embedded control and data acquisition, the BL2100 Series provides comprehensive integrated control capabilities in a compact 105 x 87 x 24mm form factor. The BL2100 is also suiatble for remotely monitoring and supervising other programmable systems or for ethernet-enabling a new or existing product. Available in four flexible configurations -- two with ethernet, two without -- all Smartcat models feature 40 digital I/O, 3 RS232/485 serial ports (plus one programming port), Rabbit 2000 microprocessor at 22.1MHz, 128K SRAM and 256K Flash (standard), 7 timers, and battery-backed real-time clock. For demanding applications, the BL2100 and BL2120 models include 11 channels of 12-bit resolution A/D input and 4 channels of 12-bit D/A output. The Smartcat's 16 digital push/pull outputs allow per-point sinking or sourcing, addressing the needs of both domestic and international markets. A 122 x 32 graphic display with seven relegendable keys is available as a user interface. User-programmable LEDs provide quick-status feedback, and the entire board/display/keypad assembly mounts in an integrated plastic enclosure. Programs are developed for the BL2100 using Z-World's Dynamic C Premier software development system. Software libraries and a built-in converter program facilitate display of international characters, bitmap images, and graphic constructs such as circles, lines, and squares. An extensive library of drivers and demo programs is also provided. All BL2100 models can be programmed and debugged over ethernet/internet using appropriate accessory hardware. A low-cost tool kit is also available, containing all the hardware tools needed to jumpstart design, including user manual with schematics, demonstration board, wire kit, serial cable for programming and debugging, ac adapter, and mounting base. Dominion Electronics 02 9906 6988.